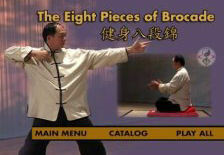 We have found a fair few number of videos, DVD and VCDs for eight pieces silk brocades - often they are included with a bigger compilation of qigong exercises. Al Simon has taken an innovative approach to the teaching of the classic Qi Gong pattern 8 Brocades. What you get for your money is an interactive computer book that you run on your PC. The ebook includes text, posture illustration, photos, and videos. The detailed information and posture instructions lay strong foundations for safe and effective practice of Tai Chi and Qi Gong as well as a thorough grounding in the brocades. What is also nice is that you are invited to sign up for free mini Qi Gong course which has sample lessons from the full course. That way you get to see if the teaching style is right for you. Not strictly speaking a teaching dvd - more of something to practice with every day. A combination of qi gong warmups, the eight brocades and shibashi. An excellent example of stillness in motion. Very easy to follow. UK based company with different versions of the routine on VCDs - just put 'brocade' in the find box the the top right hand side and take it from there. US based company with range of Mandarin Chinese VCDs - posts internationally.